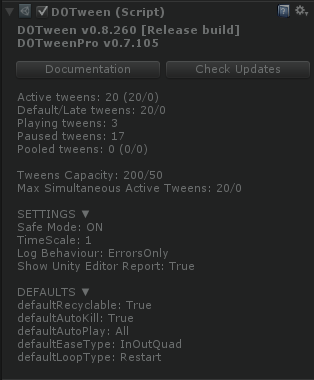 It is also the evolution of HOTween, my previous Unity tween engine. Compared to it, DOTween is more than 400% faster, more efficient, more type-safe, avoids useless GC allocations and offers new shortcuts and features. DOTween is compatible with Unity versions 2018 to 4.6. Not only very fast, but also very efficient: everything is cached and reused to avoid useless GC allocations. All code is complete with XML comments and organized to get the most out of IntelliSense. Also, everything is type-safe: no strings anywhere. Time is calculated in a very precise way. This means that 1000 loops of 1 second each will play exactly as long as a single loop of 1000 seconds. 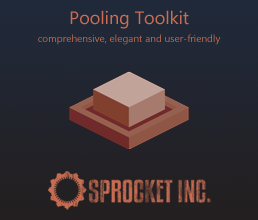 An API made to boost efficiency, intuitiveness and ease of use. DOTween can animate every numeric value and also some non-numeric ones. 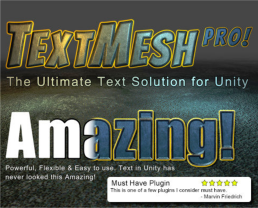 It can even animate strings, with support for rich-text. 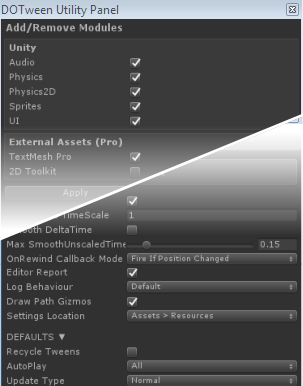 You can activate/deactivate references to Unity's systems (physics/audio/UI/etc) via DOTween Modules. Choose additional options on how to tween your values, like snapping (snaps values to integers) or axis constraints. Play, Pause, Rewind, Restart, Complete, Goto and tons of other useful methods to control your tweens. Combine tweens into Sequences to create complex animations (which don't need to be in a, uh, sequence: they can also overlap each other). Some tweens can blend between each other in realtime, thanks to powerful DOBlendable shortcuts. Animate stuff along both linear and curved paths, with additional options for the orientation of your traveling agents. Change a tween's start/end values or duration at any moment, even while playing. Activate the optional safe mode and let DOTween take care of unexpected occurrences, like a tween's target being destroyed while playing. Various "WaitFor…" methods to use inside coroutines, that allow you to wait for a tween to be completed, killed, started, or for it to reach a given position or loops (and if you have Unity 5.3 or later, CustomYieldInstructions are also implemented). Rotation tweens can take the shortest route, the full one, or use local or world-based axes. Is it a Tweener or a Sequence? Who cares? They both inherit from Tween, thus you can store them and control them in the same way. 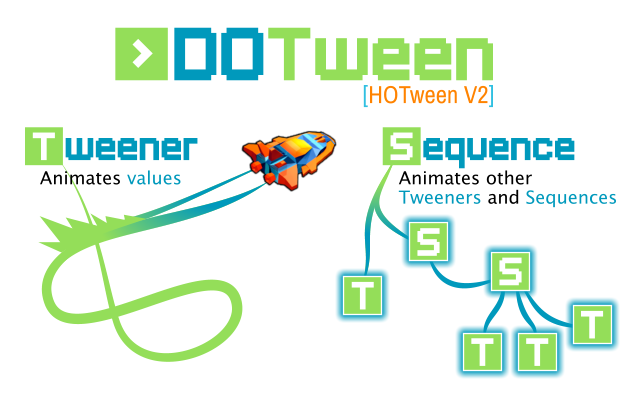 DOTween is built with an extensible architecture in mind, which allows you to create your own tween plugins as separate files. Extra virtual methods to do stuff like calling a function after a given delay. Callbacks, Loops, Ease (AnimationCurves and custom ease functions included), SpeedBased and many other tweening options. Also, choice of update type: regular, fixed, late, plus options to make it timeScale-independent. A utility panel that lets you activate/deactivate Modules and setup default DOTween settings/options, plus check for updates, etc. 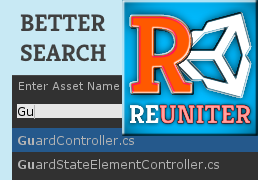 If you select the [DOTween] GameObject while playing, the corresponding Inspector will show you useful informations, plus buttons to directly open the online documentation and check if you have the latest version. DOTween Pro is out and extends DOTween with new scripting shortcuts, a visual animation editor, a visual path editor, plus extra features for 2D Toolkit and TextMesh Pro. 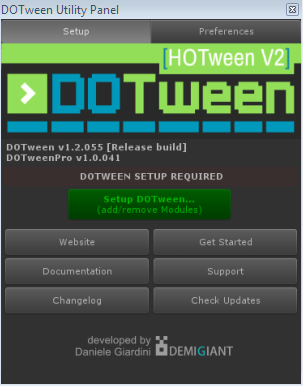 DOTween is free and open-source like HOTween, but there is a special Pro version which contains extra stuff and that requires a small one-time fee. I hope you will understand and will support this decision. If you want, you can download the test package I used (oops sorry, I'll put it up there when I get into beta, otherwise I should update it every hour - but you can still get the most recent one from DOTween's GitHub repo). All these tests were done from a build, since some of these tween engines (DOTween, HOTween and GoKit) do additional stuff while in the Editor to show editor-only debug informations, and thus testing them outside the editor, where it counts, seemed more fair. To keep the test accurate download the latest versions of all engines and replace the old ones (the ones used here are from July/August 2014). You'll find more tests for the tween of generic floats because GoKit and iTween couldn't tween as many as the other engines, but I still wanted to show high-level results.